This afternoon (December 12) at 5pm (EST), the entire Fluoride Action Network team will be featured on this month’s International Fluoride Free Teleconference (IFFT). The call is free and will provide a year-in-review of the fluoride issue, as well as provide an opportunity for supporters to ask the FAN team questions. So please plan on joining us for this opportunity to interact with fellow campaigners from around the world and have your questions about fluoride and the Fluoride Action Network answered by the experts. REGISTER NOW. The post–a funny or shocking picture with a humorous or sarcastic phrase superimposed, known as an internet meme–went viral. It reached over 4.2 million people, was liked by more than 6,000, and shared by 39,000. While the meme was going viral, our Facebook page gained over 5,500 new followers, going from 65,000 to now over 70,500. If you think you can create a meme clever or catchy enough to go viral, here’s your chance. 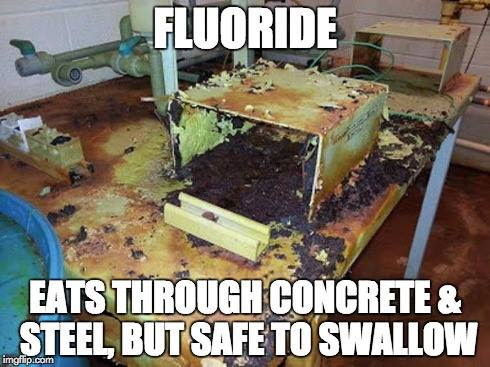 Please submit your own memes and infographics to FAN (email: stuart@fluoridealert.org). Our staff’s top picks will be shared in a future bulletin so supporters can vote for their favorites. The overall top memes will be shared on the FAN Facebook page at the perfect time to ensure maximum views and shares by our 70,000+ supporters, with credit given to its creator. Then we will see if the winning submissions have what it takes to become a viral internet meme. Submit your memes and infographics today! Your fluoridation message could educate millions of Facebook users. Yesterday, Friday Dec 11, we raised $896 from 11 people to bring our current total to $23,198 from 134 supporters. Thanks to a generous pledge every dollar donated today and Sunday (up to a total of $1000) will be matched. Other upcoming pledges: 1) when we reach a total of 200 donors we will receive another $200 and 2) when we reach a total of $30,000 we will receive another $2000. Our mini-goal for Dec 24 midnight is $75,000 from 500 supporters and our overall goal for this year is $200,000 from 1200 supporters. A banner “thermometer” has now been posted on our home page ( www.fluorideACTION.net ) to help you track our progress between bulletins.